Gruden said he was thinking about returning to the NFL. Guenther had heard this before, but “he had a little different look in his eye this time.” When Guenther got home he told his wife, Patrice, that Gruden might be coming back—and if he did, he’d almost certainly want Guenther to coordinate his defense. Guenther joined the Bengals in 2005 as a low-level assistant and was promoted to linebackers coach in 2012. When defensive coordinator Mike Zimmer left for the Vikings head job in 2014, Marvin Lewis pegged Guenther to take over. However, Zimmer had wanted Guenther to take that same post in Minnesota, and Jay Gruden, who got the Washington job that year, also offered his defensive coordinator position. Four years later, as the 2017 season wrapped up, Guenther evaluated the Bengals’ landscape. Lewis was rumored to be on his way out. Some assistants’ contracts, including Guenther’s, were expiring. Changes were looming. On New Year’s Eve, the Bengals finished their season with an upset win at Baltimore. Gruden was being linked to the Raiders job, and over the next few days Guenther started evaluating Oakland’s defense. It featured Khalil Mack, but also had a lot of needs. Gruden was contacting Guenther 15 times a day, going over possible assistants, schematic approaches, but, mostly pressing Guenther on whether he was “in or out.” If Guenther was out, Gruden needed to quickly find someone else. But Guenther was waiting for the decision on Lewis. The Bengals are known to promote from within; if their 15-year head coach did not return, Guenther was a candidate to replace him. On January 9, Paul and Patrice Guenther were in Oakland for Gruden’s introductory press conference. No team takes better care of its alumni than the Raiders, and that press conference had 10 Hall of Famers on-hand. It bordered on electrifying. The next day, Guenther and Gruden checked into rooms at a Hampton Inn just down the street from the Raiders’ facility. For the next two weeks they interviewed assistant coaches. The Raiders’ facility is adjacent to the Oakland Airport, so candidates could be shuffled in every two hours. Gruden and Guenther would get in around 6 a.m. and interview candidates from 7 a.m. until 9 p.m.
Those first three days, whenever an assistant candidate was not being interviewed, Guenther was out with Patrice and their realtor looking for a house. Patrice had casually researched East Bay neighborhoods after her husband’s dinner with Gruden. They found a place in Danville, Calif. It’s near a golf course—a plus given Jake's avidity for golf. Gruden was planning on living in Pleasanton, where he’d been in his first stint with the Raiders, but wound up renting a house a few doors down after Guenther told him about the subdivision. Now the two carpool to work. There’s minimal traffic at 4 a.m., but it’s a chance for the head coach and coordinator to meet uninterrupted. Their driver is Jeff Leonardo, who used to drive AC/DC’s tour bus and, more recently, Gruden’s Monday Night bus. “Jeff always says, ‘Man I would love to have a camera in the car, like in Taxi Cab confessions,’” says Guenther. 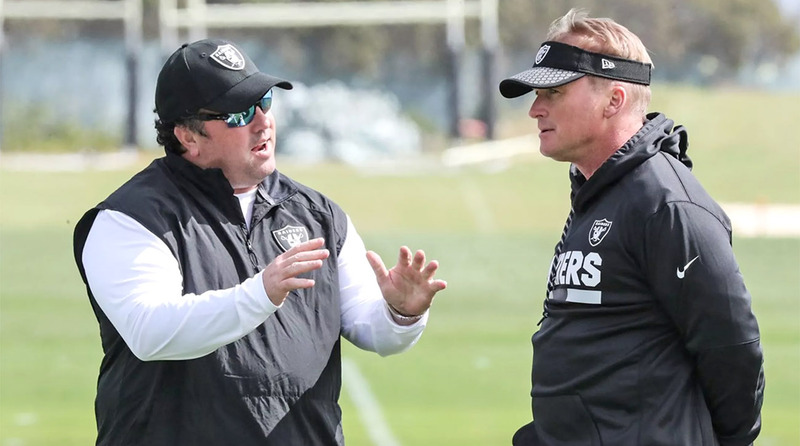 There’s an animated camaraderie and good-natured combativeness to those discussions, especially when Gruden and Guenther are debating players, and even more especially when they’re debating non-football topics. Guenther stayed in Oakland until March 1, when he went to the NFL combine in Indianapolis. Afterward, he drove two hours to his now-former home in Indian Hill, Ohio and picked up his wife and sons, who had everything ready for the movers. They flew together to their new home in California. Guenther had only seen his family once since early January. That’s because, after finalizing the coaching staff by the end of January, he spent February teaching those coaches his system. It’s a zone-based system known for it’s two-deep coverages and creative third-down blitzes. “This is the third time as a coordinator I’ve done this,” Guenther explains. “My first year as a coordinator Vance Joseph was the defensive backs coach and Matt Burke was the linebackers coach. Jay Hayes was the D-line coach, he was the lone holdover. I had to teach Matt and Vance the backend stuff, the run fits, the coverages and all the details that go with it.” After the Bengals had a strong defense in 2015, Joseph left for the defensive coordinator job in Miami and Burke followed as his linebackers coach. So, in 2016, Guenther had to reinstall the system for new defensive backs coach Kevin Coyle and linebackers coach Jim Haslett. And so Guenther not only wants unified verbiage, with everyone calling everything the same thing, he wants many of the instructions unified. For example, Guenther told his coaches to have cornerbacks “kick-slide and not let the receiver go untouched.” A coach who tells a cornerback to just press and kick-slide is wrong; he must say, “Kick-slide and not let the receiver go untouched.” The more unified the verbiage, the easier it is to teach and learn deviated concepts. After the base stuff, it’s on to coverage. Then blitzes. After that, Guenther and his coaches do the whole thing over again, this time a little faster. That’s Phase 2. In Phase 3, coaches are called up to the board to teach this stuff themselves. By then, it’s mid-March. With the weather a little nicer, the coaches go outside and walk through everything, with cameras and microphones recording it. This three-phase process follows a similar pattern that the Raiders use for players on OTAs. After watching all of the 2017 Raider games, Guenther watched every snap for each incumbent defender. He also watched practice snaps from early in the year and late in the year, looking to see if a player’s effort stayed high after the Raiders were eliminated. He watched in mostly chronological order, taking notes as he went. Some players were easy. Khalil Mack, for example. Though Guenther believes the 27-year-old perennial Pro Bowler can get better, he didn’t obsess over Mack’s film. “We still want him,” Guenther says dryly. That self-scouting process revealed holes in the depth chart, which set the blueprint for Oakland’s free agency plans. Guenther watched extensive film on free agents at positions of glaring need. “You make a list of five or six guys at each position that you want to pursue,” he explains. “You have to understand what we can afford. Our cap guys try to give us an idea of that.” That’s very much a moving target. Remember: Every player the Raiders studied was reviewed by 31 other teams. That’s a lot of potential bidders, with a lot of opportunity for players to suddenly leave the market. One position of significant need was linebacker. Guenther watched film on the top free agent linebackers, with his fellow defensive assistants and even offensive assistants eventually joining in. After that, “if you really like a guy, you bring him in and test his knowledge. If it’s a match, you try not to let him out of the building.” One linebacker Oakland really liked was former Lion Tahir Whitehead, who visited on the first full day of free agency and left with a three-year deal worth $19 million. Not every team involves its coaches so extensively in scouting, but it was a familiar process for Guenther. The Bengals have one of the NFL’s smallest front offices and ask assistant coaches to do a lot of scouting. That experience proved invaluable because, while reviewing his own team and upcoming free agents, Guenther also had to prepare for the combine. That meant hundreds of draft prospects to learn. To assuage that burden, Guenther starts this process during the previous year’s summer break. This late June/early July he’ll vacation at his place on Jersey Shore; after about a week he’ll grow bored with sitting on the beach and spend two hours a day watching 2019 draft prospects. When April rolled around, the coaching staff was intact and fully up on the scheme, incumbent players had been evaluated and major free agents had been signed. There was finally enough time to focus fully on the draft. Guenther and his position coaches corroborated their pre-draft reports, with each man putting a grade on each player. The grades were broken into three parts per round: A, B and C.
Guenther gets it. “We’re going to go as far as Derek Carr takes us,” he says. “Donald Penn is getting up there in age and we need some young tackles.” He’s also quick to point out that third-round edge player Arden Key and fifth-round defensive tackle Maurice Hurst were both ranked by his staff as top-five at their respective positions. The NFL in California in 2018: The Best Year Ever? After the draft, those new players, be it rookies or free agents, showed up for OTAs and started learning the scheme much like the coaches did months before. Their progress is constantly monitored. On another wall in the defensive meeting room, across from the list of defensive packages, is a depth chart comprised of players’ names on magnets. Guenther marvels at how more than 25 names up there now are first-year Raiders. “It’s basically a half-new roster,” he says. It’s pointed out to him that one of those names is Senquez Golson, the former Steelers second-round pick who lasted just a few weeks in Oakland before being cut on May 23. “Oh, yep, gotta take Senquez off,” Guenther says, dropping the magnet into a bin of markers and erasers. Phase 1 and Phase 2 OTAs were in late May. The coaches would hold morning meetings with the players and install the defense. That would be followed by position group meetings, then a walk-through. Whatever was installed in that walkthrough is then executed at full speed, then against the Raiders offense. The NFL limits these sessions to 90 minutes on the field and two hours for players at the facility (this does not include the two hours players can spend working out off the field). There’s little time for players to review their practice on film. Phase 3 OTAs, which allow for six total hours instead of four, offer more all-encompassing learning opportunities, and minicamp, which was June 12-14, allowed for players to be at work for 10 hours.